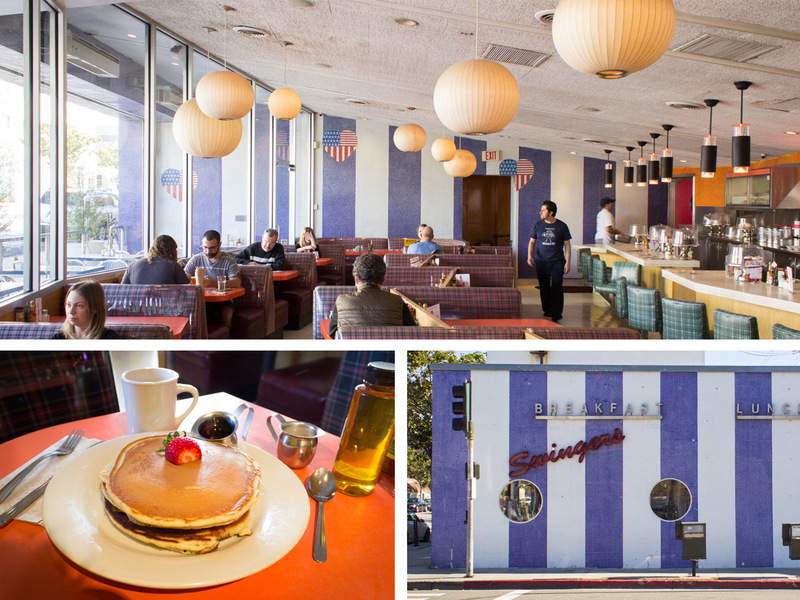 Forget Prohibition-era speakeasies: Nothing genuinely channels the past like LA’s finest retro diners. These architectural landmarks designed in the Googie style—a retro-futuristic aesthetic inspired by car culture and the Space Age—are a place to slice into a short stack of pancakes among geometric interiors and a whole lot of neon signage. We expect a few simple things out of a diner: all-day breakfast, generous hours and a relatively cheap, no-fuss experience. These retro spots check off all of those boxes while also taking us back to a time when cheap comfort food and spacious parking lots seemed like cutting-edge technology. 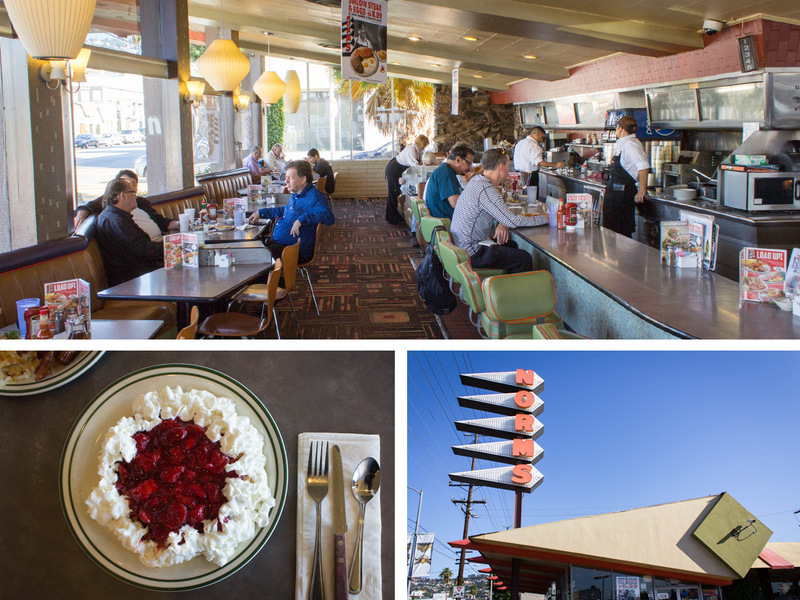 How many retro diners in LA have you been to? Atmosphere: The playful marquee out front is the only hint that a boxy Best Western houses the 101 Coffee Shop, a bright midcentury throwback. 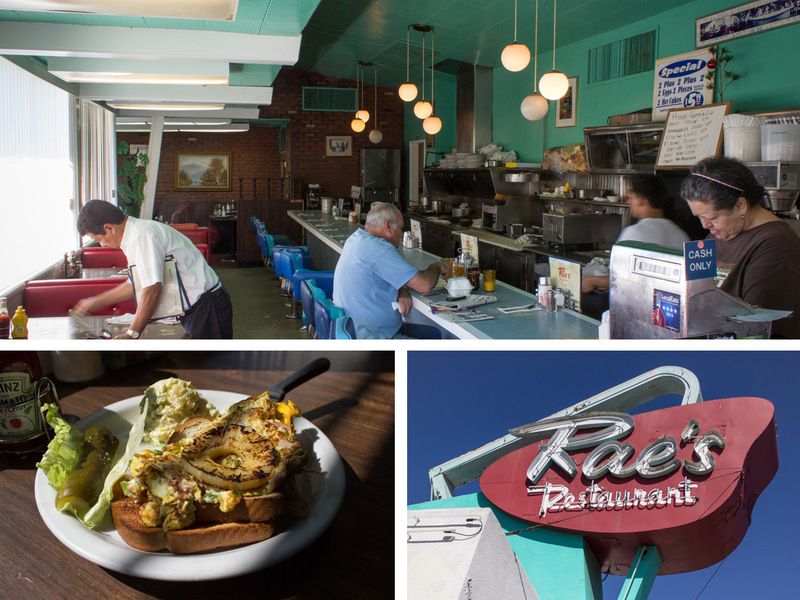 The decades-old diner hadn’t aged so gracefully, by all accounts, until a 2001 renovation sent it back to the ‘60s. The results are tremendous: spherical pendant lamps line the rear rock wall while natural light floods in against the blue-trimmed, earth-tone tiles. A contemporary playlist and Hollywood clientele keep the vibe cool, but in all other ways it’s a straight up time warp. Food: You’ll pay a pretty penny (in diner terms) for the food at 101, but there are some definite stand-out dishes here. Breakfast is served all day, and you'd be wise to order the Mikey Fitz: two eggs, two pieces of bacon or sausage and three silver dollar pancakes or one piece of French toast; we recommend the sausage, generously spiced and not too greasy. The sandwiches have a Southern slant (po' boys and blackened catfish abound), but a solid pick is the BLT, which comes with a mix of crisp sweet potato and regular fries. Save room for the 50/50 Shake made with orange sherbet and vanilla ice cream. As we noted on a recent visit: “It almost tastes more like a creamsicle than a creamsicle.” And that’s a good thing. Atmosphere: In distinctly Southern California fashion, this Burbank standby—built in 1949, making it the oldest surviving Bob’s Big Boy location—is all about the automobile. Its colossal neon sign and familiar, rotund Big Boy recall a time when roadside restaurants screamed at drivers for their attention. The parking lot might as well be a second dining room, with carhop service on Saturday and Sunday nights as well as a classic car meet-up on Fridays. Inside, seasoned regulars chat with affable waiters at the lengthy concave countertop that cuts through the coppertone diner. The most notable feature, though, is a sense of pop culture history, with a designated booth that the Beatles once dined at and the knowledge that for seven years, a neurotic David Lynch came by every day at 2:30pm to slurp down a chocolate milkshake. Food: Breakfast is available all day at Big Boy’s, but if it’s bacon and eggs you crave, you may be disappointed. The Eggs with Bacon or Sausage (two eggs, two strips of bacon, hash browns and toast) is on the bland side, needing a healthy dose of pepper and salt. So what’s good here? The burger, which comes with a juicy medium-rare patty and just the right amount of ketchup, relish and mayo. The accompanying fries are crisp wedges that don’t get soggy over time, but the real kicker is Bob’s shake—particularly the chocolate, which comes with a sidecar of extra blended ice cream that makes one order enough for two sweet-toothed diners. Atmosphere: Foxy’s wooden A-frame sets it apart, stylistically speaking, from most other retro diners in LA. This Glendale restaurant's dark wooden planks, including a dropped “V” rafted along the center of the ceiling, keep the interior cozily dim. You’ll find brassy, arrowhead-shaped fireplace hoods on either end of the space: one set against a rock wall, the other flanked by floor-to-ceiling windows. Frequently visited by families, the diner also has an outdoor patio where large groups can chat over their meal. 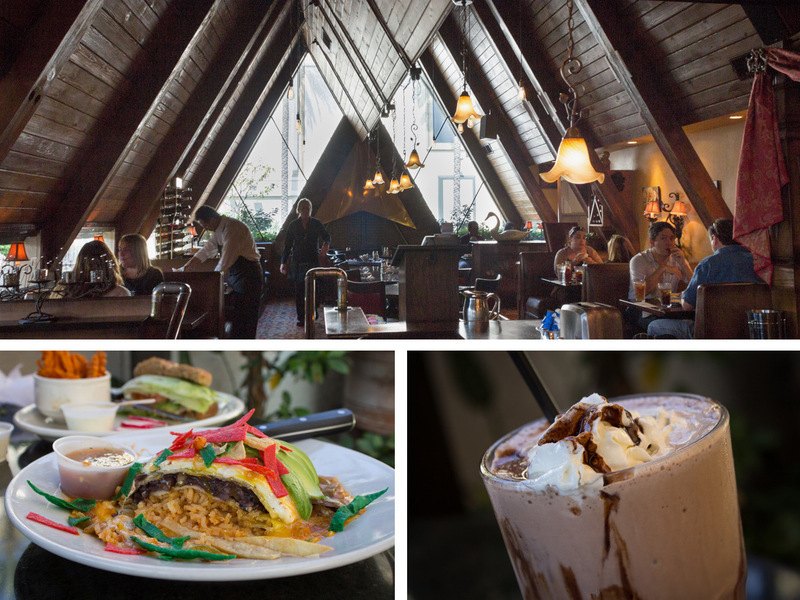 Food: The menu at Foxy’s is a gargantuan, multi-page affair, with a photo for almost every dish and cuisine that skews toward Mexican. South-of-the-border breakfast plates seem to be the most popular items, and also happen to be the best of the bunch. Take, for instance, The Leaning Tower of Mexico: three corn tortillas layered with Spanish rice, black beans and two over easy eggs, all topped with fiery ranchero sauce, avocado and cheese. There are shakes here, too, and while they're thin and not as creamy as some other diner versions, it’s a decent note to end on. As seen in: Nothing we’re aware of; get on it, location scouts. 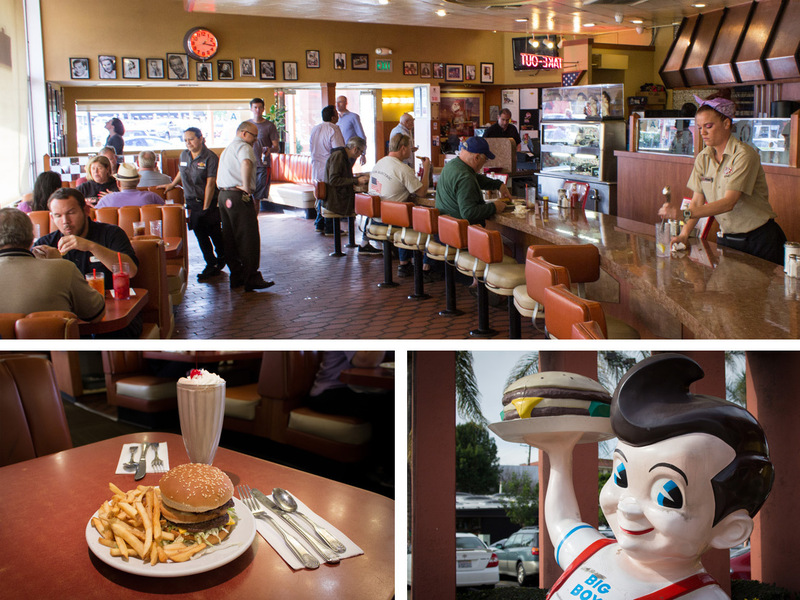 Atmosphere: The oldest surviving restaurant in the Norms family, this Googie icon has welcomed drivers along La Cienega since 1957. Though the interior has lost some of its sparkle, its defining features are still intact—bucket seats, a slanted ceiling and large, zigzagging windows. The car showroom-like exterior is still dazzling thanks to its sharp, pennant-shaped sign and cantilevered roofline. Though the restaurant has changed owners and faced a demolition scare, the building’s future is safe thanks to its recent Historic-Cultural Monument designation. Food: Sitting down at one of Norms cozy booths, you might be handed four or five different menus—a multi-page full menu, a breakfast menu, a low-cal menu and occasionally a special menu detailing the diner's baby back ribs selection, just for good measure. During the weekday, a Bigger Better Breakfast is available from 4am to 2pm at the commendable price of $6.59: two eggs, two sausage links, two pieces of bacon, two hotcakes, hash browns and grilled ham. It's a sizeable spread, but nothing particularly stands out. To give it a little oomph, upgrade the hash browns to a fully loaded version with bacon, cheddar cheese, green onions, diced tomatoes and salsa. Sweet-toothed diners may be drawn to the strawberry waffle instead, which sags under the weight of stewed berries and a generous spray of whipped cream. As seen in: Drag Me to Hell, Ed Ruscha's "Norms, La Cienega on Fire"
Atmosphere: Though the Theme Building may be LA’s most famous Space Age structure, this 1958 diner is just as stunning. All things faceted are in fashion at Pann's: pyramidal lamps, a diamond-shaped clock and an irregular roofline. That same style extends to its expanded patio and the small jungle that surrounds the exterior. The care that’s gone into keeping this family-run restaurant in tip-top shape is evident in everything from its ruby red booths and white bar stools to its perfectly preserved neon sign (with the most delightful little starburst ornaments). Maybe that's why the clientele here runs the gamut, from regulars who have been dining here for decades to first-timers looking for serious comfort food. 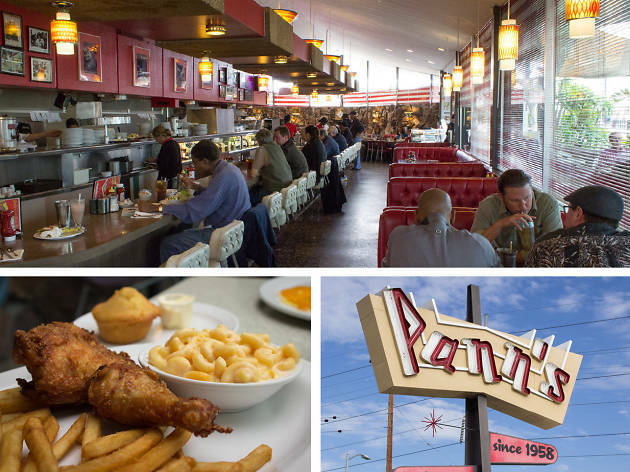 Food: When it comes to Pann's menu, one item stands out above the rest: fried chicken. Take a single bite and you’ll have juice dripping down your chin; two bites and you’ll be marveling at how crispy and well-seasoned the skin is. So for breakfast, you could take a more traditional route—a classic breakfast plate comes with two eggs, nicely browned hash browns, fluffy biscuits and bacon—or you could opt for the fried chicken and waffles, regarded by many as some of the best in LA. Whatever you choose, make sure it comes with a side of fries, golden with a dusting of Cajun spice. A list of specialty milkshakes includes a chocolate banana shake—creamy, rich and enough for two people to split. Atmosphere: What Rae’s lacks in size and sleekness, it makes up for in character. Red, pint-sized booths and blue bar stools punch up the interior’s already cheerful turquoise backdrop. It has its midcentury touches—a slightly canted ceiling and clusters of globe pendant lamps over the counter—but the interior mostly feels down-to-earth. The exterior, on the other hand, is decidedly out of this world thanks to its glowing neon trim and Googie signage; we could stare at its artist's palette and boomerang-shaped marquee all night. The bare bones service is decidedly old school here, but the seasoned clientele don't seem to mind. Food: Rae’s has the feel of a diner that remains oblivious to the passing of time, including the shockingly low prices of its breakfast, lunch and dinner fare, which remain, for the most part, in the single digits throughout the menu. 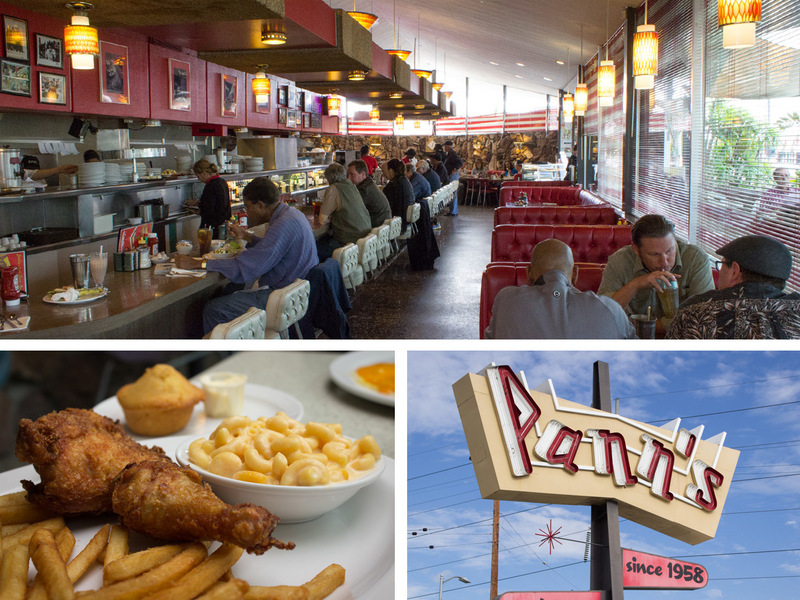 Known for their namesake, ½ pound burger, this is diner food to its core. The Denver Sandwich is an open-faced creation, with toast that holds a pepper-filled omelet and a thick, grilled slice of pineapple; your choice of potato salad or coleslaw comes on the side (get the potato salad). Fries are solid here—thick, lightly crunchy and without an excessive amount of grease, which is quite possibly the only non-retro thing about this place. 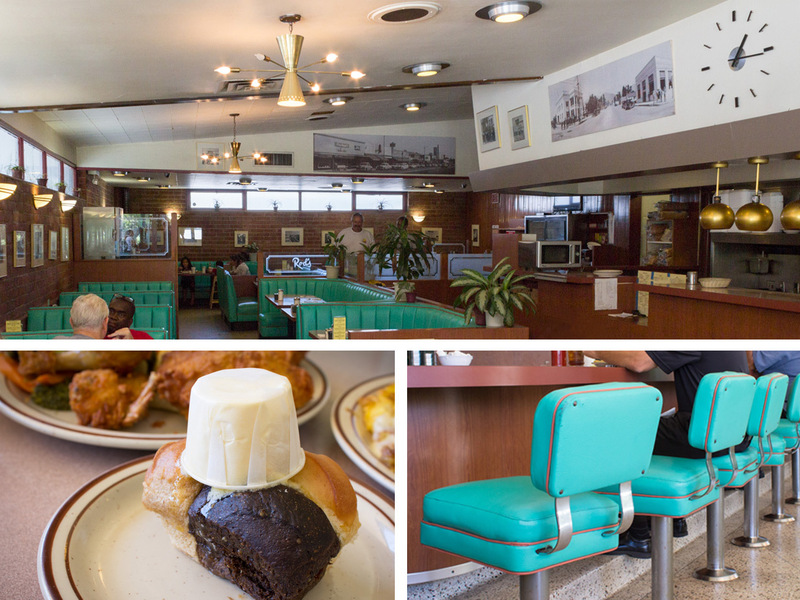 Atmosphere: For a space so committed to its time—from an archaic cash register to a period-appropriate soundtrack—this ‘40s Arcadia diner manages to stay humble and warm. That’s not to say you shouldn’t ogle at some of the finer features at Rod's Grill: the cantilevered ceiling, fin-shaped roofline, spoked hourglass lamps and spherical, brushed-metallic heat lamps over the kitchen window. The mostly brown interior manages to stay lively thanks to the most magnificent turquoise booths and bar seats, where you'll find regulars nestled in for their mid-day meal. Food: Nestled into those booths, you may spot a sign that reads “Special: Apple sausage omelet.” Get it—the breakfast dish is one of the best items at Rod’s. Sweet apple chunks and spicy sausage are folded into a golden omelet and topped with a massive layer of Jack cheese; put simply, it’s hangover food at its finest. A fried chicken plate is offered from noon until they run out of chicken, accompanied by fries or mashed potatoes and vegetables. The veggies aren’t memorable, the fry batter could use a little more spice, but the fries are fantastic and the chicken itself is pleasantly tender. And because you need more carbs in your life, order the twisty roll. It’s a marriage between pumpernickel and wheat, and arrives with a small carton of butter upended on top. Atmosphere: Though still a few blocks from the ocean, the Santa Monica location of Swingers radiates the beach city’s sunny, easygoing atmosphere. The cantilevered ceiling opens up to greet floor-to-ceiling windows, while its blue-and-white-tiled exterior wall welcomes in light through a trio of portholes. 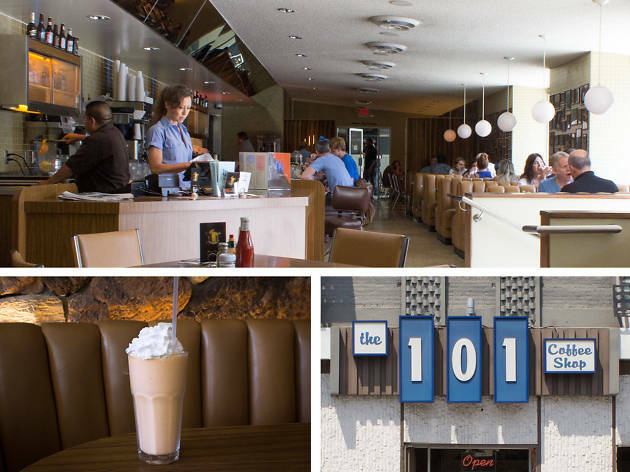 The diner is a mutt of retro design and throwback flair, a place where oversized paper lanterns and tiled walls manage to mix with plaid plastic upholsteries and purple cow graphics. It’s bigger and brighter than its Beverly Boulevard counterpart, though that space boasts a beautiful, blue and white curved facade. Food: The prices on Swingers’ menu can make you feel like you’re getting away with something—it’s that much of a steal. The food here doesn’t skimp on quality, though. A short stack of pancakes is one of the diner's best breakfast plates, made an even bigger accomplishment by the fact that they’re plain and not doused in whipped cream or slivers of fruit. The French toast is a dream, too, so it’s clear that Swingers has their breakfast carbs down pat. Also a plus: the counter is a friendly spot if you’re dining alone.